The cool, moist and dark conditions of a root cellar make it the perfect place to keep many fruits and vegetables crisp and delicious for weeks — even months — of storage. And while there are myriad ways to store vegetables, our innovative root cellar plans show you how to build a root cellar by modifying a new, precast concrete septic tank. By following the plans, you'll cut an entrance, install a door, add a pair of vent pipes and cover the tank with soil to bring an old-fashioned, walk-in cellar into your modern life. You'll want to buy an unused septic tank for this root cellar design, but look for a deal to avoid paying full price. A percentage of all precast concrete septic tanks end up with small manufacturing defects that prohibit them from being used for sewage treatment. Suppliers sometimes offer discounts on these flawed tanks. As long as the tank is solid and sound, a chipped edge or a patchable hole won't prevent it from being a root cellar. You won’t need the plastic fittings or effluent filter found inside most septic tanks, so ask the supplier to remove these before delivery. Tank size is another detail you'll need to consider when planning how to build a root cellar from a septic tank. The capacity of septic tanks is measured in gallons, with different models being taller or shorter. While you might be tempted to buy a 1, 000- or 1, 200-gallon tank because they’re common, you’ll get more food storage space and headroom with a tank that's 1, 500 gallons or larger. Standard 1, 500-gallon tanks typically measure about 5 1/2 feet wide by 5 1/2 feet tall by 10 feet long, while a 2, 500-gallon tank provides more than 6 feet of interior headroom. Don’t choose a low-profile tank because it will be much too short to work in. Prices for new, undamaged 1, 500-gallon tanks start at about $1, 100, and 2, 500-gallon models can be found for as low as $1, 600. Discounts for damaged tanks may be as much as 50 percent. Most septic tanks have an internal partition that must be opened or removed to build from these root cellar plans. Try to find a tank without a partition, or ask your supplier to remove it before delivery. You can also punch through the partition yourself as part of the doorway-cutting process. The perfect location for a root cellar is nestled into an existing soil bank in a well-drained location 10 to 20 yards from your house. Ideally, the door should face north to keep out the sun’s heat. You’d be fortunate indeed to have all of these conditions, and most people have to modify their sites. Expect to pay from $50 to $100 per hour for a backhoe and operator to excavate your site for three or four hours. Spread a 1-foot-deep bed of three-quarter-inch-diameter crushed stone beneath the excavated tank site and the planned entryway to support foot and wheelbarrow traffic. Crushed stone is easy to move around to make a level surface for your tank. Suppliers usually offer a delivery service using a boom truck to set down the tank wherever you want. Check the tank with a 48-inch level after the boom-truck driver has set it into place. If the tank isn't level, have the driver lift the tank so you can get a rake underneath to move the crushed stone. Keep setting, checking, adjusting and replacing the tank until it sits flat and level. The tank should be in its final position before you cut the door opening, because removing concrete could weaken the tank enough to cause damage if it were moved again. Use a level and pencil to mark a rough opening on the end opposite the effluent pipe hole. Locate the bottom of the door 4 inches above the floor to keep dirt and rainwater out of the cellar. A concrete-cutoff saw is the tool of choice for making a door opening (see "Cutting Concrete” sidebar below). Set up a large work platform a couple of feet lower than the tank's top, don eye and ear protection, and recruit a second pair of hands to hold the masonry saw from above as you move along the top horizontal cut line. Make the two vertical cuts next, then tackle the horizontal cut across the bottom. Leave a small amount of concrete uncut in the upper corners to hold the slab in place until you're ready to bust it into the tank with a sledgehammer. Repeat this process to remove the inner partition if your tank still has one. 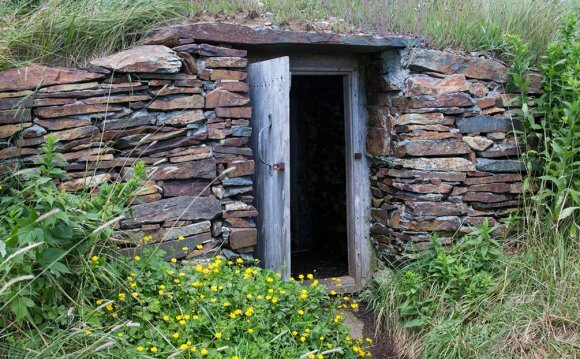 You can make your own root cellar door out of wood, but getting it to seal well will be difficult. Consider using an insulated steel residential door pre-hung in a frame. Exterior steel doors provide exceptional seals. Choose one without a window because darkness is essential for maximizing the storage life of produce.